Some additional pages need to be created to complete the Stripe set-up. All of the pages created for the Stripe integration. Go to Appearance → Theme Options → User Pages and set the pages appropriately, like in the following image. Save your changes. Set up of Stripe pages on the User Pages page. The Stripe webhook page is where events relating to your Stripe payments will be sent – the page template will log these, and deal with them appropriately, for example, by saving the donation as a Pledge. 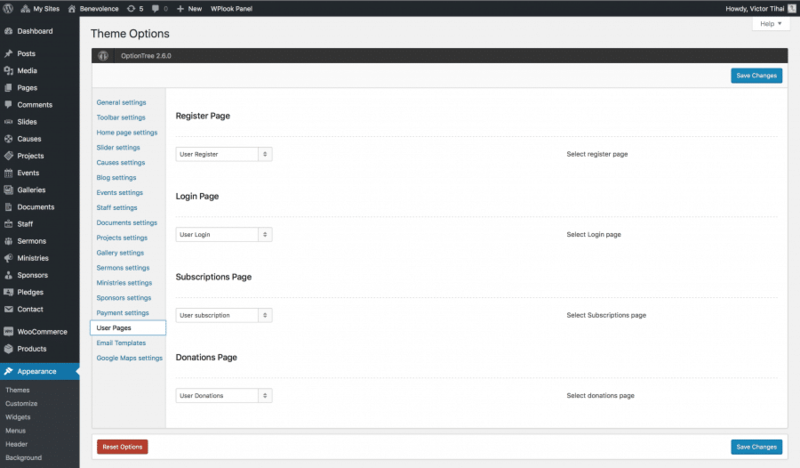 Stripe’s dashboard, with the Webhooks Settings page selected. 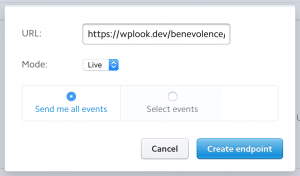 In this pop-up, paste in the URL, set the Mode to Live and select Send me all events. To save your changes, click Create endpoint. The webhook page must be accessible from the internet, so if you are testing the theme on your computer, Stripe payments will not complete. If you want to customize the content of the emails sent to customers after completing Stripe transactions, head to the Email Templates chapter of the documentation.